Our culture is very harsh and only rewards certain criteria. Also, those kinds of rewards come from the outside. When I have the opportunity to share my appreciation of someone else, it gives both of us a lift. I especially like to let parents of my students know that they are doing a good job raising their kids because they are. People recognize what is good and wonderful about themselves. We all need to hear those things. The traditional things that we have been harassed into believing are good, turn out not to be. The really old traditional things like family and honesty and fulfilling work do turn out to be true. I am glad I can give weight and time to expressing appreciation for the things that are real and good. Even though it is in the face of finely tuned expensive advertising, sincerity does have a different feel to it. People, being real, respond differently to honest communication, rather than constant sales pitches. 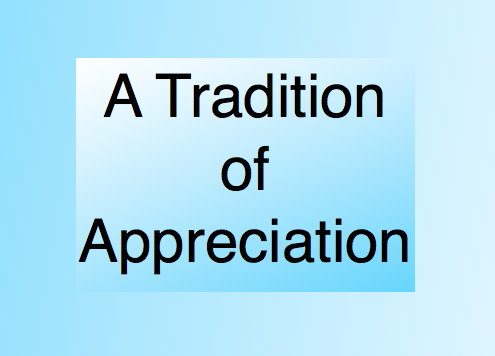 Giving authentic appreciation helps people tune into who they really are. Its like a deep breath of fresh air. Nothing is required of them except being themselves, their true selves.